When Rosanne Alexander’s boyfriend Mike was offered the job of warden of Skomer, a small uninhabited island off the south west tip of Wales, they had just ten days to leave college, marry (a condition of employment) and gather their belongings and provisions for the trip to the island. This was the first of many challenges Rosanne and Mike faced during their ten years on the nature reserve, from coping with periods of isolation when they were the island’s only inhabitants, to dwindling food supplies during the winter when rough weather made provisioning from the mainland impossible. Thrown on their own resources they had also to deal with catastrophes like the devastation of the island’s seal colony following an oil spill. 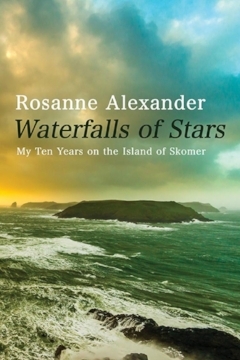 With great sensitivity, and humour, Rosanne Alexander relates their experiences on Skomer, including her observations of the island’s wildlife and landscape. It is an important breeding ground for many birds, and shearwaters, puffins and kittiwakes – and the seals – become a source of pleasure and companionship. With her lyrical evocation of the natural world and its enthusiastic and resourceful approach to the problems of island life, Alexander’s book will inspire and entertain anyone who has felt the need for escape. ‘Even now, the slightest thing can take me back: the way the sunlight catches in the turn of the wave or a distant bird call, half-heard, snagged in the breeze. Then, in that moment between eye-blinks, I am there on a cliff top at the edge of the Atlantic’. And so am I. Take the book in your hand and it is like setting off across the choppy sound in a small boat to Skomer. I’m talking about the front cover of course. A storm is brewing: the orange blue colour of an angry sky juxtaposes with an aquamarine hope in the top right-hand corner; these colours are intensified by a warm paradise sun, peeping just beyond the spine. This is what you see when you first take Waterfall of Stars into your hand. The island is there too; it looks like a melancholic whale, trailing through the waves – a living creature rather than some piece of rock. As I read this lyrical account of the Alexanders’ sojourn, it struck me how words still transport us, and how we all subliminally crave for a decade on a lonely, uninhabited island on the edge of the Atlantic. It was impossible to enter the water there without feeling the breath snag in the back of my throat and thinking ‘never again’, but its appearance was so limpidly enticing that I fell victim to its temptations again and again. Then, as the first sensation of shock subsided, I was won over. I became lost in the fascination of that different world, following my ghostly pale hands as they parted a trail through the shuddering fronds of seaweed. This sensual image is just one of many that she paints for us as she is ‘lost in the fascination’ of these new worlds. I could not eradicate that image from my mind for days. I envied that experience. It triggered some distant memory in my own mind when I went snorkelling as a child. It was either the ‘ghostly pale hands’ or the seaweed trails that did it. It is Alexander the artist that is swimming here. This is not the first Welsh island to draw the gaze of a literary painter. Brenda Chamberlain lived on Bardsey and then there was David Jones, who was drawn to the rocks of Caldey with his sacramental gaze. Rosanne Alexander has added Skomer to that Welsh portfolio of island works. The Alexanders painted during their sojourn and I was surprised, at first, when she did not include any illustrations, paintings, or photographs in the book. Perhaps this is an experiment with words where the sonic palette of imagined bird calls, rich adjectives, and personal memoir portrays the island in much clearer and realistic hues. But I still would have liked some pictures. Alexander’s writing is captivating. It is experiential, fresh, and alive, reflecting the peripheral environment where this book was born. Perhaps this is why travel writing, or at least books about place, remain as popular as ever. They give us a dose of fresh air which gives us a craving for more and more and we are not satisfied until we step outside and find something worth writing about. Everything was a first; nothing was lost in the haze of routine. She’s honest. Even the extensive use of adjectives is part of the honeymooned lexicon which makes this story real. She does not shy away from describing the frustrations which add to the colourful tapestry of marriage. There is much joy too and an Adam and Eve feel to the narrative; a man and a woman, isolation, a beautiful but dangerous habitat, and animals galore. My favourite has to be Wellington the goat who causes them to fall now and again! The animals are never over-anthropomorphised, but we do feel that we know and care for them. The book involves us and we are as hungry as they are when they run out of food. I was heart wrenchingly gutted when the precious pear pudding was ruined or when a bird flew in through the window, leaving shards of glass in the freshly cooked pies. The structure of the book was always going to be tricky. How does one sum up ten years in three hundred pages? I was sceptical at the beginning but I was soon broken into the rhythms of the island. The structure becomes less important. These are, after all, the moments ‘between eye-blinks’ and memories should never be restricted by the chapters and divisions of mainland life which run with Filofax accuracy. By the end of the book, I was both ready and unready to leave Skomer. Maybe that’s what Adam and Eve felt as they left the confines of Eden? Anyhow, the reader should not rush through this experience. Stay in Skomer for a while, close your eyes, and breathe the fresh air of the Atlantic. I have been fascinated by the Pembrokeshire islands since going on a field trip to Skokholm as a schoolboy, so I was delighted to be given this book to review. Delighted, but a little apprehensive that it would not be worthy of the jewel-like, other-worldly dream-place that is Skomer. After all, much has been written before, notably by R.M. Lockley, whose works are classics of their genre. On receipt of the book I was also somewhat daunted by its format of small-font, closely-spaced text running to about 350 pages. I need not have worried. What we have here is a beautifully written, highly personal account of a young woman's life-changing ten years on a small island with just one companion. There is something deeply moving about this seemingly timid and unassuming young woman taking the enormous step of incarceration on a small island with her barely-known husband. This takes the book beyond nature writing into an almost anthropological investigation into the workings of the human spirit. Having said that, it is, indeed, nature writing of a high order: truthful, compelling and at the same time clearly expressed with modestly understated poesy. Lucid and original description enables an appreciation of this jewel of an island. Rosanne Alexander's metaphors are well thought out and pleasingly avoid the banal and the obvious. There is a good mix of natural history and reflective introspection, and the reader quickly warms to the bold and courageous ways in which she adapts to her unique circumstances, rather like the animals with which she shares her situation. There is no shortage of drama. Skomer is only a few miles off the Pembrokeshire coast, but the seas are extremely fickle and treacherous. There are many days when it is impossible for boats to cross the sound, and the inhabitants (in the winter just Rosanne and Mike) can be stuck on the island for weeks on end. They are dependent on their own resources and resilience. Some of the storms are truly ferocious, and the author describes them with admirable force, and sometimes terror. In the ten years that they were there, they had to cope with two major oil-spills from tankers in the Irish Sea. These tragic events were dealt with by superhuman efforts from a team of both naturalists, the RAF and workers from the oil industry, and Alexander covers the process with thoughtful compassion as well as seething anger at the despoliation of her once pristine adopted home. There are many lyrical moments when the author revels in the serenity and beauty of her surroundings. In describing the phosphorescent autumn sea she says, ‘it all added to the feeling that Skomer had almost endless layers to be unravelled, more than anywhere I had ever known’. She has unravelled many of these layers, and will leave readers longing to experience the island for themselves, as well as admiring the dedicated and resourceful people who look after it for us.